When Linda Inglett was diagnosed with a potentially fatal brain aneurysm, she thought at first her doctor was speaking to someone else. After all, she was seeing an ear, nose and throat specialist about a problem with her vocal chords, not a neurologist about her brain. Inglett, 57, was so stunned at the news that at first she thought it had to be a mistake. Then she saw the scans of her brain, which clearly showed a large aneurysm. The next day, Inglett passed out and was found on her bathroom floor. She was rushed to the hospital, but was told surgery wasn’t possible. She took medicine for a while, then passed out again. Because the aneurysm was located in the center of her brain, traditional brain surgery wasn’t an option because it would cause severe brain damage. At first, Inglett had no idea where to turn for help, so she began calling hospitals and medical centers around the country. Finally, when Inglett called Boston, she got an answer. “The woman said, ‘It’s showing a Dr. Jay Howington right there in Savannah,’” she says. Inglett was admitted to St. Joseph’s Hospital, where Howington performed a fairly new type of surgery called an edovascular embolization, in which platinum coils and stents were inserted into her brain. She has a year to go in the recovery phase, but so far her recovery has been remarkable and she says she feels as good as new. As frightening as the diagnosis was, as hard as it was to face brain surgery, the thing that scares Inglett the most is this -- her aneurysm was discovered purely by accident. If her ENT hadn’t decided to scan her entire head instead of just her vocal chords, it wouldn’t have been found in time to save her life. Since her own diagnosis, Inglett is determined to help others. She operates two Web sites, visits neurology patients and their families to offer advice and support, and raises money for equipment to diagnose and treat aneurysms and other neurological disorders. Inglett also wants to promote early diagnosis. “Mammograms have become routine,” she says. “Why not brainograms? There are tests that can be done to detect aneurysms. She’s also thankful for the care she received in the St. Joseph’s/Candler’s Institute for Neurosciences. Inglett plans to help the hospital raise money for its new neurological intensive care unit. The previous neurological intensive care unit was good, but the new one is spectacular. “It’s like going from the Motel 6 to the Ritz,” registered nurse Dana Welser says. The staff had been waiting for the new unit for about three years, Welser says. “Once we saw the blueprints, we got so excited,” she says. Each patient room contains a futon, recliner and chair, plus an end table with a lamp for the patient’s family to use. “Research has shown that patients get better quicker with 24-hour availability to their families,” Welser says. Each room has a ceiling-mounted, multiple-support “tower” with access to oxygen and other gases, suction, electrical receptacles and data ports. The patient’s bed and the tower both are in the center of the room. So far, St. Joseph’s Hospital is the only hospital in the country to have this kind of set-up. The arrangement allows 360-degree access to the patient, says Diane Hinely, nurse manager of neurosciences. “When we have to get to a patient, we can get to the patient,” she says. “When the neurologist needs to get to the patient’s head, he can. The bed can be turned and angled more easily than beds in a typical intensive care unit. Each nurse in the unit is assigned two patients. The nurse sits at a pod that is located strategically between two of the patient rooms, providing a view of both patients at all times. The unit is designed for immediate critical care, and once patients are stabilized, they’re moved to a step-down unit. Because the patients in the unit are so critically ill, the rooms were designed to be large enough to hold all the equipment needed to treat them. Most patients are admitted to the unit for treatment of brain aneurysms, strokes, brain tumors and seizure disorders. “Time is of the essence,” Hinely says. Anyone who thinks they might be having a stroke should be taken to the nearest emergency department immediately, Hinely says. What are the symptoms of a stroke? Hinely uses the anagram FAST to explain them: “F” is for face, If your smile is uneven, there is facial droop or numbness or vision disturbances, you could be having a stroke. “A” is for arm and leg. If you have weakness in a limb or difficulty walking, you could be having a stroke. “S” is for speech. If your speech is slurred, you use words that are inappropriate for the sentence or you suddenly become mute, you could be having a stroke. “T” is for time. Time is critical, so call 911 immediately if you think you are having a stroke. Inglett is hoping to raise enough money to put even more equipment in the new unit. “If 50,000 people each just sent in $1, that would finish this unit,” she says. Revenues are steadily dropping, Cheatham says. “We’re not getting the same level of reimbursement, yet we’re asked to treat more and more patients,” she says. The St. Joseph’s/Candler health system continues to benefit from Mary Telfair’s 1875 bequest to found a women’s hospital. 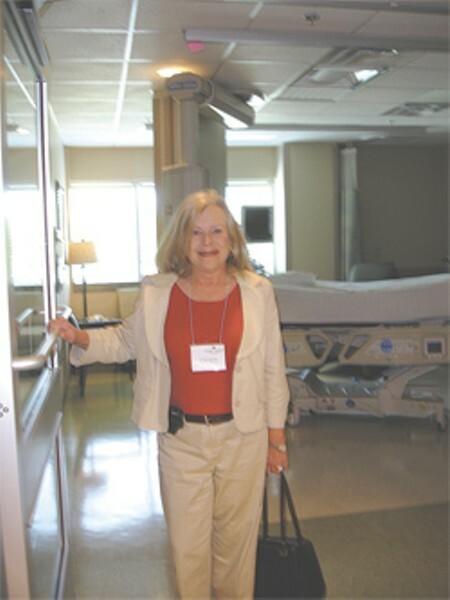 More recently, the Nancy N. and J.C. Lewis Cancer Pavilion was opened because of the Lewis family’s generosity. Persons who are interested in making donations or setting up bequests should contact the foundation to find out what options there are, Cheatham says. No donation is too small, she says.